Try your hand at a few organic beef jerky recipes for a protein rich, on the go snack. Uniform thickness - In order for your beef jerky to dehydrate at the same rate, try to cut the strips ¼ inch thick. Cut against the grain - Jerky is supposed to be chewy but not tough. Cutting the meat against the grain helps to ensure that no one is going to lose a tooth while enjoying a piece. Adequately marinate - If you want your jerky to be full of flavor, make sure you marinate at least eight hours. To get the optimal flavor, try marinating the meat overnight. Marinate evenly - Every couple of hours, you might want to move the meat around in marinade so it distributes evenly through the beef. Dry it out - Dehydrate your beef jerky at around 145 degrees Fahrenheit for at least two to four hours. Doing so at this temperature for this amount of time helps to prevent spoilage down the road. If your oven doesn't go that low, set it to 200 degrees and open the oven door a little bit. Proper storage - Always store the jerky in an airtight container. There is no sense in letting all of your hard work go to waste. 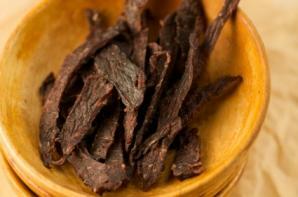 Here are some great organic beef jerky recipes for you to experiment with. Keep in mind that all ingredients listed need are available organically. If you're having a hard time finding the organic ingredients, a list of different brand names is available at the end of the recipes section. Mix all the ingredients together in a bowl and pour into a zip lock bag. Annie's Naturals - Dijon mustard, Ketchup and Worcestershire. Simply Organics - Garlic powder, onion powder, coriander, chili pepper flakes and black pepper. Making your own organic beef jerky is well worth the time. Not only does it save you money (store bought beef jerky, organic or not, is expensive) but you can store the jerky for up to two years in an airtight container.